Jeroen Stel Nature & Wildlife Photography: Some more "Focus Stacking"
Have been experimenting a little more with "focus stacking" and this time instead of using the Photo Acute program i usually use for this job i have tried stacking within the new Adobe Photoshop CS4 stacking tool. It works through Bridge in CS4 where you load the images in layers in Photoshop and then you align them and stack them and i must say i am pretty pleased with the results! 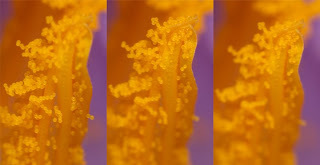 Here's a stack of 3 images (see below) of pollen of a stamper of a crocus flower. 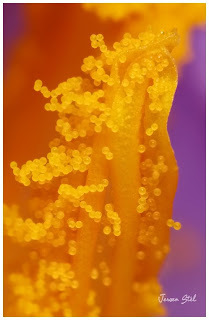 These pollen are around 1/10th of a millimeter and are hard to get into focus. I used the 1D Mark III combined with a 2x Teleconverter, and 96mm of extension tubes and a macro rail in order to get this extreme magnification. Perhaps stacking more images would have provided even more depth of field but for now this was a nice excercise. All where shot at F11-1/200 sec-200 ISO-macro rail-Gary Fong Lightsphere-home made bracket.